Elżbieta Gajek PhD. Assistant professor at the Institute of Applied Linguistics, University of Warsaw; Head of Department of Methodology of Teaching English; Head of Centre for New Media in Applied Linguistics; Teacher consultant at the Computer Assisted Education and Information Technology Centre in Warsaw. She specializes in Computer Assisted Language Learning, and Computer Enhanced Teaching Languages, and the use of digital media in learning. Under her supervision students of Institute of Applied Linguistics have created nearly 500 video clips as teaching aids. She participated in many European projects. 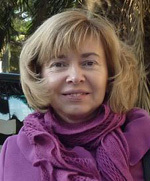 Author of several publications on the methodology of computer assisted language education. Since 2004, an expert at the National Support Service of the eTwinning Programme. She evaluates projects submitted to national and international competitions.